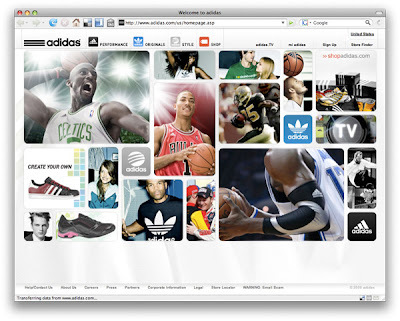 The Adidas site isn't so much a site as it is a content kingdom. Just a look at their homepage tells you that there are no quick visits. Each of the images above opens up on roll-over to reveal a call to "Experience", giving you the feeling that they're all doors to other worlds (or mirrors to other worlds). The "Experience" calls take you to a wide-screen scrolling area where you can enjoy the content in a more linear fashion. 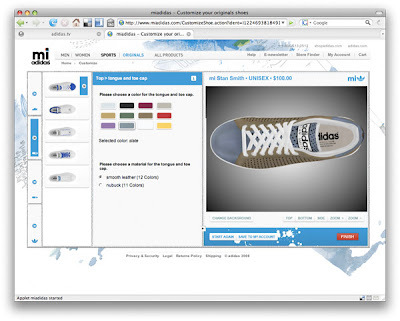 As you peruse these screens smaller pop-ups will appear occasionally pointing out Adidas products within the images. For example, Kary Perry is wearing an adidas shirt, and a pop-up asking if you want to check this out will appear. Clicking on that will expand the lower panel to reveal products along those lines. What first seems overwhelming actually becomes comfortable. This site blends the advertising in with the shopping, giving you the feeling that you're exploring the adidas kingdom, where you can buy what you see, or just enjoy it, instead of being forced into more typical retail buckets. I entered only as an observer, and found myself shopping...not remembering the moment the change took place. I even started building a shoe. Which is a great application btw. I've grown away from the idea of having your own channel of videos on your site. This is best left to Youtube. But a quick check revealed that yes, they have all these videos (or most of them) on their YouTube channels as well. Yes..channels with an "s". I checked Facebook....1,849,953 fans. damn.